How to pick better fonts – India, Ink. How do you pick your fonts? It’s easy! Just look at type samples and find one that catches your eye. Throw that one out. It’s very basic, as advertised, but he mentions a way of using the golden section that I’d never considered, so you, too, may learn something. See also his other posts there: “Five lessons corporate publishers can learn from independents” and “Using the Internet as a Book Marketing Tool,” part 1 and part 2. It’s my considered opinion, of course, that instead of designing your own books, you should get Tom or me to do it . 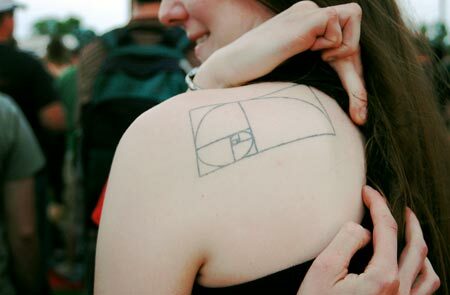 . .
Photo: Golden Section tattoo by j l t / Joshua; some rights reserved. Previous Post Wrong, all wrong! Next Post What is one thing you would you do to change book publishing for the better? Thanks, India. I’m much indebted to you. I’m so behind in my webwork, but some day soon I hope to acknowledge all your kindness on my site. it is important to remember than digital publishing is faster and in some respects more flexible and convenient than print publishing, and it routinely reaches much larger audiences. Purely as a means of delivering words to readers, print cannot compete with online alternatives. Larger publishers have been trying to reduce the expense side of their finances by lowering the quality of production, for example by printing on paper that is barely distinguishable from newsprint and probably has about the same life expectancy. I believe this is a mistake. One great thing the book has going for it is its aesthetic quality, which far surpasses that of digital publishing. A well made book is a treat for the hand and the eye. I think traditional books will survive the digital revolution but that their role will change. They will become luxury items, keepsakes, so whoever still knows how to make the nicest books will win. But I’ll bet that a lot of well-meaning production people don’t even know how to spec well-made books, because all they’ve ever been asked to do at their jobs is make everything cheaper and faster. And as the vendors that excel at quality work die off—Stinehour comes to mind—it will become even more difficult to acquire that kind of experience. So I’m thinking you’d be the perfect person to write a post (or series of posts!) that goes from front to back of a high-end book, discussing cover materials and finishes, endsheets, binding, paper, ink, and whatever else distinguishes the truly well made from something that will warp and yellow in twenty years’ time. I know I’d appreciate it . . .
No one under fifty knows anything about that stuff, and it’s immensely valuable. Kids today… They think you can rebind a perfect-bound book if the cover falls off (it will, but you can’t)! They think a perfect-bound book in board covers is a “quality hardback”… aargh! Please take the assignment! It’s not showing up as a trackback here, but Tom’s asked the question of his own blog’s readers: What are the components of a well-made book? So far, unfortunately, everybody’s there is just talking about text design . . . and thereby completely missing my (and the person who suggested the subject to me’s) point. It doesn’t matter how sensitive the design is if the book turns to powder at age twenty-five. I’ve got more than a few hardbacks from the 1990s that are, as John describes above, nothing but perfect-bound books in hardcover drag. In another five years, the spines are going to pop open. I also find it excessively optimistic to think that paper books will remain affordable enough to survive in general use. The viewing quality, interface design, and user experience of e-book readers will continue to go up, and their cost will continue to come down; at the same time, as the planet’s already overexploited resources get stretched thinner and thinner, the extravagant expense of printing books on dead trees and dragging them all over land and sea will continue to go up. The current process, using the current materials, is not sustainable, and no amount of nostalgia can hold off Mother Nature. We’re headed for a severe resource crash, within our lifetimes. If humanity is really, really lucky and can find ways to halt or reverse the galloping rate of environmental damage we’ve been doing, books may survive in some form; if we can’t, well, I’m pretty sure that picking the fonts will be somewhere below the absolute least of our problems. What worries me most about the death of paper publishing is: the trees! The trees are going to get us! Think about it. The trees are going to be out for revenge. Those zillions of trees we don’t kill are going to grow all over everything, gum up the machines, and get us! I think we might need to figure out a new way to keep the trees under control. Maybe start making computers out of paper?